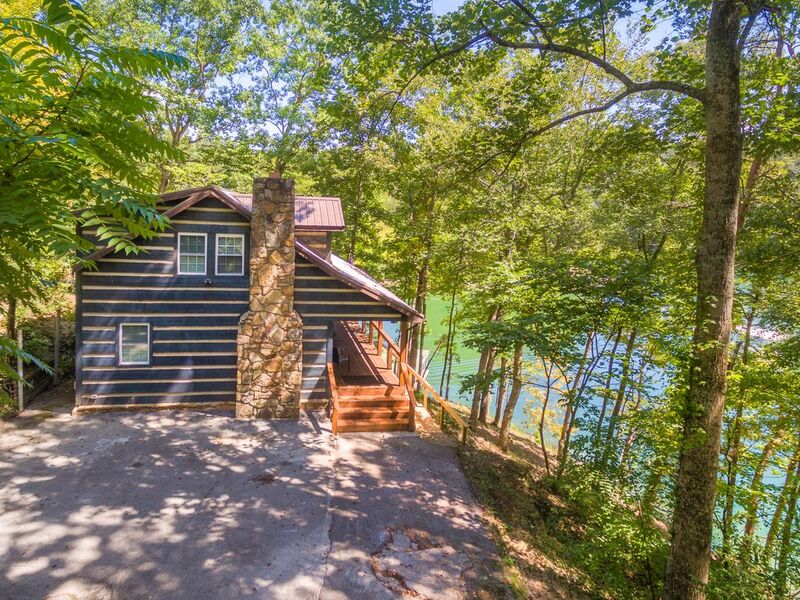 Just minutes from I-75, this secluded lakefront cabin is the perfect getaway for your family vacation or holiday. The cabin, named Nauti Pines, is newly renovated in a rustic modern style and can accommodate 10-12 people. It is a 4 bedroom, 2 bathroom cabin that is situated on 5.5 acres, with 1100 feet of water frontage that is just minutes from Twin Cove Marina on Norris Lake. The interior offers an open kitchen with granite countertops, black stainless steel appliances, and a seven foot island. You will also find granite in the bathrooms in addition to the new tile floors. The whole cabin has been updated with new furnishings to ensure your stay is as comfortable as possible. The outside is just as accommodating as the interior, with ample seating on the spacious deck and covered porch, oscillating fans to stir up a breeze on those warm days, and a small bar overlooking the covered dock and swim platform. Just pack your bags, because Nauti Pines has everything you need. *Please note, as lake levels recede, dock accessibility will be more difficult verses summer lake levels. Phillip and Cameron grew up together and are Norris Lake natives. Their friendship extends over 10 years. Phillip is a RN at a local hospital and Cameron is a full time Realtor. In 2015, they began buying, investing, and selling real estate and have flipped multiple properties since then. When not working and renovating houses, Phillip enjoys hunting, fishing, wake surfing, and diving. You will find Cameron traveling, hiking, boating, or piloting a plane. Nauti Pines has been a dream for them since they began. They bought it in April 2018 and it had been vacant for over 5 years. They totally gutted and renovated the property from top to bottom and are ecstatic to offer it as a vacation rental to Norris Lake enthusiasts. It offers the most peaceful setting, while having Norris Lake at your fingertips. It offers a tranquil atmosphere on 5.5 acres while being close to I-75. The 1100 feet of shoreline is assured to give you plenty of lake access. Private on 5.5 acres with 1100 feet of water frontage. Norris Lake is one of the the cleanest lakes in the TVA system and offers over 800 miles of shoreline. *Please note, as lake levels recede, dock accessibility will be more difficult vs. summer levels. Detergent and fabric softener NOT provided. Trailer parking available at the top of the hill inside the gate. Limit of 2. Vehicle parking is tight at the property, limit of 4, any others should be parked at the top of the hill. Couch and love seat with two end tables and a 50 inch smart TV. Seating for 5-6. Dishes, dinnerware, cookware, and utensils are provided. Custom Mocha cabinets with high quality granite and stainless steel super sink. 8 person table with seven foot island and 3 bar stools. Flatscreen TV in each bedroom and living room. Xfininty Cable with over 200 channels. Inquire with owner about renting kayaks. Lower level living space and outdoor decks are wheelchair accessible.